A look at the latest statistics on price trends indicates that the risk of deflation seems to have given way to renewed inflation in the major developed countries. So do we really need to fear the return of inflation, or are these economies still structurally deflationary? First, note that the nature and scale of the economic crisis we have been living through since 2008 are reminiscent of what led to past periods of deflation (the crisis of 1929, the Japanese crisis of the 1990s, etc.). The recessionary pattern that began in 2008 has followed the same path: the shock to activity led to a slowdown in inflation — and sometimes lower prices or wages — in most of the developed countries. However, a fall in prices is not necessarily synonymous with deflation: this has to be long term and, above all, it must be anchored in expectations and a vicious cycle of debt deflation. But this deflationary scenario did not materialize. Far from sitting by idly, at the end of 2008 governments and central banks took fiscal and monetary measures to stabilize activity and limit the rise in unemployment. Moreover, independently of the response by economic policy, price trends were strongly influenced by changes in commodity prices. While the collapse in oil prices in the second half of 2008 accelerated the deflationary process, the rise in prices since 2009 has fuelled more general price rises and held off the risk of deflation. Moreover, business has partially cushioned the impact of the crisis by accepting cuts in margins, which has helped to mitigate rising unemployment, a key factor in the deflationary process. In a study by the OFCE published in its journal of forecasts (Prévisions de la Revue de l’OFCE), we start from a wage-price model to develop a method for assessing the way that oil price dynamics and labour market adjustments affect changes in inflation. 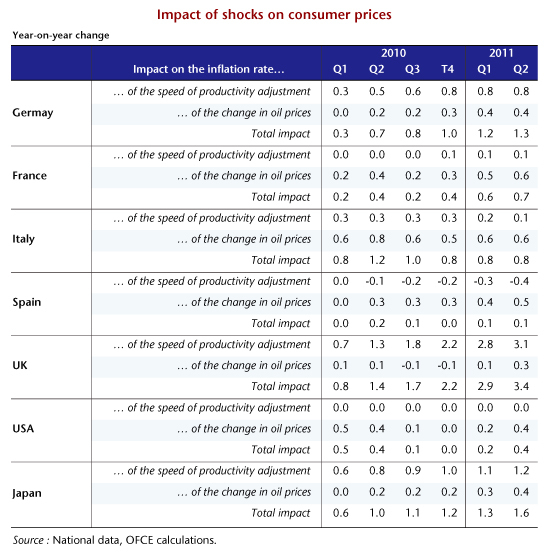 We show that if oil prices had continued their upward trend after they peaked in the summer of 2008, and if the adjustment on the labour market had been, in all countries, the same as in the US, then the year-on-year change in inflation in second quarter 2011 would have been lower, by 0.7 points in France to 3.4 points in the UK (Table 1). This confirms that these economies are still structurally deflationary. Despite the central banks’ repeated efforts at quantitative easing, they need not fear the return of inflation. The macroeconomic environment is still characterized by a risk of deflation, and therefore by the need for an accommodative monetary policy.